At Hunter's 6-months checkup the doctor asked if I had started feeding him solids. I replied that I had and that I was doing Baby-Led Weaning. I got one of those sideways glances with a raised eyebrow. "But you're also feeding him iron-fortified cereals, right?" I left that appointment completely second-guessing my decision to do BLW exclusively. I wondered if I should start adding cereal to Hunter's diet. It's not like I want my child to become anemic! After scouring the web in search of lists of iron-rich whole foods as well as the pros and cons of fortified infant cereals, I decided to stick with my initial gut feeling. I just don't feel right about feeding my baby iron-fortified cereals. I have my reasons. First, I really would like to avoid all grains until after Hunter's first birthday, mostly because grains are generally more difficult to digest, and also because I would like Hunter to learn to love veggies, meat, and fruit before he gets to try bread and rice. Kids usually love bread no matter what, so I'd just rather put it off for as long as possible. Finally, I believe that BLW is a great learning tool for babies. 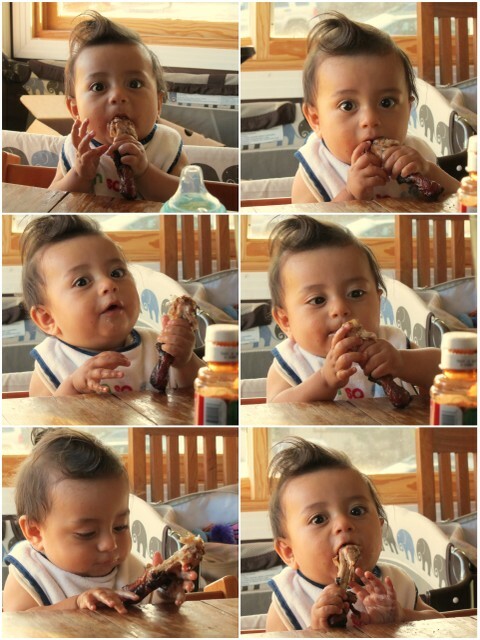 I think it's a fun way to learn about food, and I want to stick to the idea of letting baby feed himself, so that means no cereals or purees. Yes, eventually, Hunter will be able to spoon-feed himself foods like yogurt and later oatmeal, but until then, he gets to munch on finger foods. So now what? Well, my plan is to provide Hunter with opportunities to eat whole foods that are naturally high in iron, such as chicken liver (I guess I need to start cooking that), beef chuck and tenderloin, turkey, chicken leg and breast, tuna, pork, shrimp, lentils, beans (kidney, garbanzo, navy, black, pinto), spinach (and other leafy greens), and raisins. The important thing is to also pair these foods with whole foods that are rich in Vitamin C to help with iron absorption, such as citrus fruits, berries, broccoli, squash, bell peppers, cauliflower, fresh herbs, Brussels sprouts, kiwi, melons, and tomatoes. Don't second guess your decisions. My baby hated cereals. She never ate them and her iron levels were fine. The first time she had grains was around 10 months when she could feed herself toast. My doctor told me breast milk had everything she needed. They do give baabies in Northern Europe vitimin D but that's because there is so little sunlight. I fed her puree for the first few months. That is handy if there is a growth spurt and baby can not feed themselves. As soon as she was able to feed herself we switched to finger food. She hasn't had 'baby food' since her first birthday and she loves to eat fruit and veggies. She even eats her yogurt with a spoon now! However because she has always been breast fed she will not drink cow milk. Just water. I will help with the tomatoes. I'm bringing some on Friday. hey mandy! are you supplementing with vit. D? I just wondered how necessary it was. my pediatrician recommended the normal buy-it-at-Target cherry flavored nasty vial of vitamin D for my newborn, but I couldn't stomach giving my tiny baby a huge dropper of cherry-flavored grossness every day. he hated it. I went and bought Carlson's Baby Vitamin D drops at Whole Foods. Totally flavorless and just one tiny drop a day. I know it's totally off-subject, but what's your opinion on this?